How Does CSS work? | URimagination, Inc. In this lesson you will learn how to make your first style sheet. 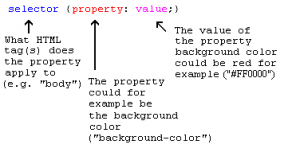 You will get to know about the basic CSS model and which codes are necessary to use CSS in an HTML document. Many of the properties used in Cascading Style Sheets (CSS) are similar to those of HTML. Thus, if you are used to use HTML for layout, you will most likely recognize many of the codes. Let us look at a concrete example. But where do you put the CSS code? This is exactly what we will go over now. 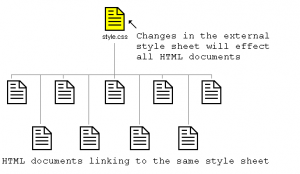 There are three ways you can apply CSS to an HTML document. These methods are all outlined below. We recommend that you focus on the third method i.e. external. The recommended method is to link to a so-called external style sheet. Throughout this tutorial we will use this method in all our examples. An external style sheet is simply a text file with the extension .css. Like any other file, you can place the style sheet on your web server or hard disk. Notice how the path to our style sheet is indicated using the attribute href. This link tells the browser that it should use the layout from the CSS file when displaying the HTML file. The really smart thing is that several HTML documents can be linked to the same style sheet. 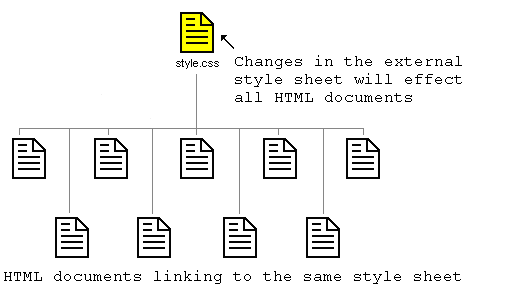 In other words, one CSS file can be used to control the layout of many HTML documents. This technique can save you a lot of work. If you, for example, would like to change the background color of a website with 100 pages, a style sheet can save you from having to manually change all 100 HTML documents. Using CSS, the change can be made in a few seconds just by changing one code in the central style sheet. Let’s put what we just learned into practice. Open default.htm with your browser and see how the page has a red background. Congratulations! You have made your first style sheet!